I love my new Shukr skirt! It's lovely and wide at the bottom so walking is not at all restrictive: it's actually almost the same as walking in jeans :) I ordered it on Sunday and it arrived yesterday (impressive service!). Anyway, I wore it today for university with a white blouse and navy blue trench over the top (and of course a pink hijab for pink hijab day ^-^)which was a good match as the trench is annoyingly, very slightly too short to wear with jeans.. I would highly recommend anyone who wants a nice long skirt for a reasonable price to check out Shukr's wide range. This skirt was £24.95 and, in my opinon, well worth it! That is a beautiful skirt! 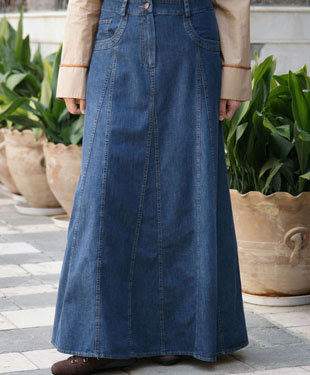 I just checked out the shukr website and noticed that they had many different jean skirts. It is kind of tough to make a choice with all of those options, how did you decide on this skirt? I'm thinking of purchasing a denim skirt myself. Salam..its a beautiful skirt. Hope u can publish it here how u mix n match it. zainab: I actually chose it is wide at the bottom so i would be able to walk in it without being restricted to tiny steps lol. It is also plain and unfussy with the detail, which I like. Equestrian Hijabi: The Hardest Request Yet!